"Discover The Fastest And Easiest Way To Play The Drums Without Spending Years On A Practice Pad Or Months In Private Lessons..."
Use my signature “Build From The Bottom Up” method to master drum beats in any style. 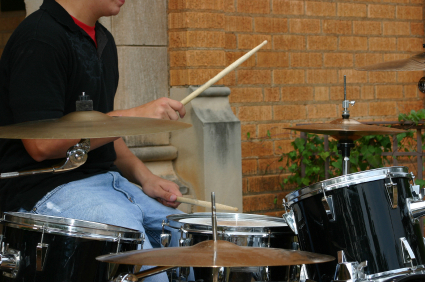 With this step-by-step video system, you'll be playing the drums before you finish your first lesson. I love the drums and am very fortunate to have made a career out of playing them. 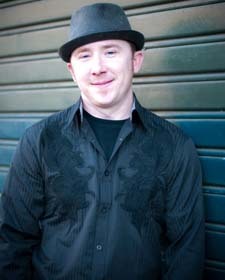 My name is Chris Atchley and I am a professional drummer that still plays to this day with amazing musicians. And I think you and I are a lot alike… the drums have been a passion of mine since I picked up my first pair of drumsticks at 10 years old. Now 25 years later, I have toured 48 states and 6 foreign countries playing all kinds of music including rock, funk, blues, and jazz. I have shared the stage with famous artists such as Louie Bellson and Maynard Ferguson to Grammy Award Winners, Evanescence. I have played at venues including the famous House of Blues on Los Angeles’ world famous Sunset Strip, to soccer stadiums in Sao Paulo, Brazil, to the coveted Carnegie Hall in New York City. My recording credits include working with multi-platinum producer Silvia Massy, who worked with artists like Prince, the Black Crowes, Johnny Cash, Tool, the Red Hot Chili Peppers, and Tom Petty. My recordings have also appeared in the hit television show, “One Tree Hill,” on the ESPN network, and in the NHL Stanley Cup Finals. Now I don’t tell you this to brag, I just want you to know that I share your enthusiasm for playing the drums. I’ve devoted my life to drumming… I know where you’re coming from. When I started out on the drums, my hero was Dave Weckl. That guy was all over the set and if there was a hole to fill in the song, he filled it. Weckl was the guy I wanted to be, so I started trying to drum like him. Like most new drummers, I definitely adopted the “Wow” factor; dazzling audiences with crazy stick tricks and intense drum fills. Most bands are NOT looking for drummers like that. 99.9% of bands need drummers that can keep solid time and find the groove for the song. If I was going to make it in the music business, I had to drop the “Look at me, look at me” mentality… and fast! So I did… and what I now call the “Build From The Bottom Up” method was born. I started with the simplest drumbeat I could play, “The Money Beat,” and worked my way up from there. Not only did my playing begin to sound tons better, what I was playing was far easier to play than all that crazy stuff I’d been practicing on for years! And then doors started to open. I became a groove machine that could work in any music style, whether it was live on stage or in the recording studio. That painful lesson took me 7 years to learn… 7 years! Just imagine the things I could have done had I known then what I know now…. And while I was learning this valuable lesson, my students were learning it too. More and more I began to simplify and streamline my drum learning system so that now even little 8 year old students can be playing their first beat after their first 30 minute lesson with me. The best thing about it? It doesn’t matter if you want to make a living in the music industry, have fun as a weekend warrior jamming with buddies around town, or just perform for your friends and family. I’ve finally created the Play Drums By Ear Drumming System to get you there… and do it fast. Do You Have Any Of These Common Questions? “Why does everything go by so fast?” – Most video instruction goes way too fast for students to really see what’s going on. I would rather you play a lesson as slow as molasses and get it right, than fast as lightning and get it wrong! “I don’t have time.” – I understand what it’s like to not have time. As a family man with 3 kids and a wife, anything more than about 30 minutes just doesn’t happen at my house. But don’t worry, you’d be amazed how much you can accomplish in 15 minutes if you do it right. “How do I use what I learn?” – This one is a biggie for sure. Just because you buy a drum set, doesn’t mean you will know how to play it, or set it up for that matter. You need someone there every step of the way to make sure you are on the right path. Discover how to play a variety of “Money Beats” on the drum set. Money beats are the best drum beat foundations for every style of music. You will be able to build layers on top of the simple beats to create your own unique drumbeats for any song. Know how to fit into any band and effectively use your time to shine. 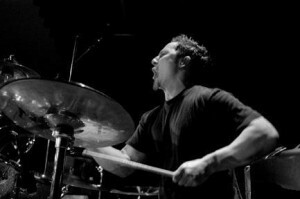 The best drummers get hired back because of their solid groove and how to play fills that work with the song. Plus they can stay out of the way when it’s time for other players to shine. Learn to play drums without reading a lick of music. This course starts you right into drumming without reading any sheet music. These drumbeats are tried and tried again to be the best in the business. How to play hundreds of complex drum licks using 4 simple methods. Drum fills always start simple… they only sound complex. You’ll get the basic building blocks down in just a few videos and then the sky’s the limit once you know how it’s really done. You’ll have a great list of resources for what gear works best for your playing. Drum, hardware, cymbal, pedal, and drumstick choices are completely personal. But I will give you my recommendations for the best gear to start with and what differences to expect from all the gear available. How to tune your drums. Tuning drums opens a whole different world of opportunities to fill your drums with personality. I go over different tunings for a multitude of situations from the stage to the living room. You’ll learn how to use your time well for practice. So many drummers end up wasting time during practice and not really getting anywhere. You will learn how to best use your time to be the best drummer you can be in the fastest amount of time. You’ll learn how to drum in different music styles. Whether the band calls a rock tune, blues shuffle, latin groove, or heavy metal riff, you will have a drumbeat to use. You’ll have live recordings with professional musicians to practice along with. From classic rock riffs to current pop grooves, you’ll be able to jam along. You’ll learn how to add drum fills flawlessly to your drumbeats and stay in time. Perfecting this will make you a sought after drummer, and this course will get you there. Learn how to read drum sheet music and drum tabs. Pro drummers know how to read both and use them to keep up with every recording session and stage show. You won’t need them to play drums, but if you want to learn, I’ve made it dead-simple. 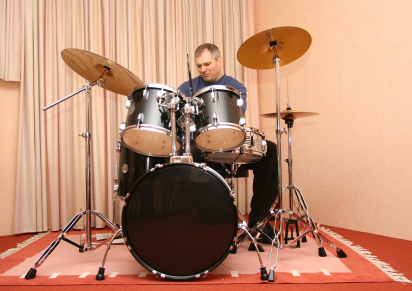 You’ll be able to build a creative drum solo that’s sure to “wow” audiences. Have access to a huge amount of tasty drum licks and fills to build great solos on stage and for your friends. You’ll be able to take all these lessons to the jam session and impress band mates and the audience. These just won’t be lessons anymore, but real world applications. I use these methods still to this date at every gig I play. The best part is that all the DVDs and CDs are easy to use and not region specific, so they are compatible with media players all around the world. 72 multi-angle instructional videos – you’ll have no trouble seeing what you are supposed to do from every possible angle. Over 18 hours of instruction – no stone is left unturned, you’ll have everything you need to succeed. Signature “Build From The Bottom Up” drum beats method – in 20 years I’ve yet to find a better system for building beats that work, fast. “E.M.S” exercises: Endurance, Muscle Memory, and Speed are the keys to success. With my “E.M.S.” systems you’ll have the skills you need fast, without unnecessary work. Simple to advanced drum fill variations – you’ll be amazed at how simple it is to take small, basic concepts, and turn them into awe-inspiring drum fills. But I’ll show you how you can do it every time. Basic and intermediate level drum rudiments – If you’ve ever heard of the “40 Essential Rudiments” and felt like that was just way too many… you’re right. I’ll show you the most essential handful of rudiments that you can learn quickly and turn into cool fills easily. Playing to a click track or metronome – the painful truth is that no matter how many cool things you can play, if you can’t keep time it’s all for nothing. I’ll show you how to use a metronome and click track to develop rock-solid timing that will get you called back every time. A printed manual that follows along with all the corresponding DVD lessons. While you won’t need it to learn to play the drums, if you’re interested in learning how to read drum charts then this tool is essential. Live recorded jam tracks with professional musicians – learning all the techniques and variations don’t matter if you never learn how to use them. 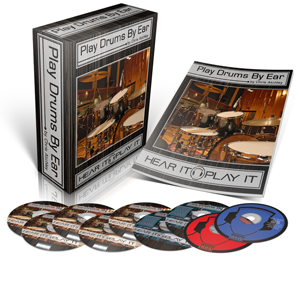 One of the biggest parts of the Play Drums By Ear system is integrating the things you learn with the recorded jam tracks based on several popular musical styles and songs. Once you get your copy of Play Drums By Ear, you’ll have 72 videos of quality drum instruction at your fingertips… That’s over 18 hours of lessons to put you on the best track to learn to play the drums by ear. In addition to the course videos, there is the printed manual that follows along with all the corresponding lessons. You won’t need the manual, which includes drum charts and examples, to play the drums, but it will be available for you to improve your drum reading skills if you choose. You’ll also get all of the jam tracks and mp3 files to put on your own system to play along with. It will be just like having me standing right next to you telling you what to do next! Don’t wait any longer to play the drums! With my help, your door into the drumming world will open, just like mine did. I want you to be more than just satisfied with Play Drums By Ear… I’ve gone to every effort to make sure you absolutely love it! So get your copy today, and run it through its paces for up to 90 days. If it’s not everything I’ve promised it to be, just let me know and you will get a full and complete refund, no questions asked. I’m taking all the risk because I know this system works! You know, if you were to go to a music school, you would not learn even half of what is in Play Drums By Ear over the course of the year, but it could set you back $10,000 or more! It’s not cheap to buy a drum set… but what good is it if you won’t know the first thing about how to play it? It’s a $1000 piece of furniture that takes up space in your house and gives the kids one more thing to make noise on. But imagine being able to grab a $500 kit and sound like a pro… you just saved $500 by making a small investment in yourself. So even though Play Drums By Ear is easily worth $900 or more, I’ve decided to keep it affordable at just $147 for the DVDs or just $97 for the Digital Download Edition! That’s over 18 hours of video lessons, the printed manual, and the live-recorded play along tracks for only $147 on DVD or $97 for digital delivery. Play Drums By Ear contains everything that will propel your drumming to the top. Even if you only have 20 minutes a day to spend practicing the drums, with my proven practice methods, you will be drumming in the fastest time possible. You aren’t going to find a deal like this anywhere else on a system that is proven to work, guaranteed. Ask the drum teacher at your local music store if he has a 90 day money back guarantee! Yes! – Please send me my copy of the Play Drums By Ear Home Study Course. I will receive 72 lesson-packed videos, play along jam tracks, and the printed manual. I understand that if I am not completely satisfied within 90 days I can get a full refund with no questions asked. Sign up now to make learning the drums a reality. PS – I know that these methods work and my students continuously remind me of it. I assure you I have been in your position and that you are in good hands. Join all those that came before you and make drumming your reality. There is no risk to you. And let’s face it – if you do nothing… well you’ll stay where you’re at and that’s just not okay. 25 years ago, the best ways to learn to play the drums were from an instructor or on your own. But a drum instructor costs money and teaching yourself costs time. Don’t waste both… grab your copy of Play Drums By Ear today!